The digitization program, an initiative of the Irving K. Barber Learning Centre, was launched in 2006. It provides matching funds that help libraries, archives, museums and other organizations digitize unique historical items, including images, print and audio visual materials. The Irving K. Barber Learning Centre funding totaled $160,000 for the 2019 – 2020 round. Altogether, the B.C. History Digitization Program has provided more than $1 million for more than 100 projects throughout British Columbia. This year’s diverse range of projects include the digitization of several historical newspapers (Nanaimo, Nelson and Victoria), audio recordings from Co-op Radio, the completion of Museum of Vancouver’s Historical Costume collection, a bi-lingual newspaper in English and Punjabi, as well as Grace McCarthy’s scrapbooks detailing her political career. In September 2006, the Irving K. Barber Learning Centre at the University of British Columbia Library announced the BC History Digitization Program. The focus of the program is to promote increased access to British Columbia’s historical resources, including providing matching funds to undertake digitization projects that will result in free online access to our unique provincial historical material. Below is a list of successful applicants for 2019. The NOCA Cream CollectorMagazine Digitization project will see the digital scanning of about 10,586 pages of the NOCA Cream Collectormagazine into searchable downloadable digital files. This project will complement theButter-FatMagazine which was digitized in 2014 and is now hosted http://www.bcdairyhistory.ca/. These digital publications provide researchers with access to BC Dairy Historical materials from the Okanagan Shuswap region of BC. The digital editions of the Cream Collectormagazine will be hosted on the website of the BC Dairy Historical Society www.bcdairyhistory.cafor viewing by the public without charge. The Tax Assessment and Collector Roll Digitization project will involve BC Records Management digitizing the tax assessment and collector rolls in the city’s possession from 1875 – 1945, a total of 32 boxes (approximately 7,500 large format sheets). The original documents will then be stored in their archival facility and the digital files will be available on the City’s website. The Co-op Radio fonds audio-visual records digitization project will digitize 585 audio tapes containing documentation of spoken word radio programs that were produced by Vancouver Co-op Radio from the mid-1970s to late 1990s. The Creston Museum intends to digitise approximately 350 photographs that document the landscapes of the Creston Valley prior to 1935 and 1947. Gain important experience in digitising collections by working in partnership with an established model and partner, Digitised Okanagan History (DOH). Year 2 of the AUCE project will continue to digitize archival materials and publications from the Association of University and College Employees (AUCE) fonds held by UBC Library’s Rare Books and Special Collections, and make them available online in Open Collections. Our first year of the project will see 12,000 items digitized with BCHDP funding; we intend to finish the project in year 2 by digitizing the remaining eligible items. grunt gallery will digitize and make available online our collection of photographic, text, and video material documenting the LIVE Biennale of Performance Art, a series founded and produced by grunt from 1999 to 2005. The Museum of Vancouver holds a significant collection of Vancouver related historical costumes recognized for its quality, size, and breadth of styles and periods represented. MOV has digitized two thirds of the costume collection of outerwear through previous BC History Digitization grants. In Phase 3, MOV will digitize the final third of the outerwear collection (approximately 900 pieces), thereby completing the digitization of this group of artefacts and increasing the public’s access to this popular collection. This digitization project will focus on the Madokoro and Oikawa families who individually made significant contributions to BC’s fishing industry in the early 1900s, survived the unjust treatment during the Second World War, and returned to the coast in the 1950s. In particular, Sajiemon Kuramoto and Jitsuji Madokoro operated the successful K&M Boat Works. In 1906, Jinzaburo Oikawa led skilled fishermen from Japan to Oikawa Island aboard the Suian Maru. The project will digitize 917 photographs, 170 artefacts, and selected high-priority textual records from the total 29.4 cm of textual material, including but not limited to 486 letters and postcards. The Upper Fraser River Forest History Resources: Access & Outreach Project will create digital access to 93 unique audio recordings and related transcripts that document the rise, consolidation and demise of a series of forestry based settlements along the Upper Fraser River within Northeast BC c. 1915 – c. 2000. These resources document this region’s forest history, forest industry operations history and that of the created sawmill communities, and will be accessible for academic research and for public use. Activities include creating of digital files, uploading materials for online access, and promoting access to these resources for broader use. This project will digitize 765 photographs and up to 50 selected textual records associated with the Japanese Methodist and United Church missions in British Columbia. Dates cover the years 1897 to 2018; the bulk of the materials dates from 1920 to 1955. The intent of the project is also to build capacity for future digitization of records relating Japanese-Canadian and Chinese-Canadian communities of faith in B.C. This project will digitize audio recordings from the Gerry Gilbert fonds in SFU Special Collections’ Contemporary Literature Collection. Gilbert was a Vancouver-based poet and performance artist. This collection of 261 cassette tapes and 11 reel-to-reel recordings features interviews, readings, and literary discussions from the Gilbert-hosted Radiofreerainforest show that aired on Vancouver CFRO from spring 1985-late 1990s. This project is part of a larger effort to collaborate cross-institutionally to make audio collections more accessible. The Grace McCarthy Scrapbooks project will digitize a collection of 88 scrapbooks compiled by Grace McCarthy, the Social Credit MLA who became cabinet minister and deputy premier. These scrapbooks include photographs, correspondence, clippings, press releases, and other ephemera dating from 1960 – 1991 and provide a snapshot of her political career and contributions to British Columbia’s political, cultural, and economic development. Key accomplishments that changed the landscape of Vancouver included bringing Expo ’86 to Vancouver, establishing SkyTrain as a rapid transit system, driving the construction of the Vancouver Trade & Convention Centre, and securing the lighting of the Lions Gate Bridge. The Punjabi Patrika, published in Abbotsford, BC, is one of only two bi-lingual, Punjabi/English newspapers published in Canada and includes unique perspectives into BC’s South Asian community. An archive of the the Patrika was recently donated to The Reach by owner/publisher Andy Sidhu. The Reach is already the steward of other major newspapers from this region, including those of the Abbotsford Post (1910 – 1924); A, S & M/Abbotsford News (1922 – present) and the Abbotsford Times (1991 – 2008). The Patrika archive enriches The Reach’s archival holdings significantly, in that it represents the first local news publication with a specific cultural perspective. The project is to digitize the first 15 years of the Nelson Daily Newsnewspaper from April 1902 to 1917. 60 microfilm Master reels of the newspaper will be loaned from BC Archives. The information on these reels will be digitally scanned by the UBC Library Digitization Centre. The digital collection will be hosted on the UBC Historical Newspapers Open Collections website. Published in Victoria, B.C., The Victoria Daily Timeswas the leading rival newspaper to the Daily Colonist in the colonies of Vancouver Island and British Columbia. Alongside their competitors, the Daily Times covered many of the same stories, but sometimes with a radically different political and socio-economic perspective. The University of Victoria Libraries has already digitized the Daily Colonist newspaper from 1858 – 1980. Digitizing reels from the Daily Times would not only significantly augment and enhance our existing digital newspaper collection, but create further impact by making additional historical resource material available online and publicly available for comparative study and research. VIU Library proposes to continue part of its ongoing 2018-2019 BCHDP-funded project, digitizing the Nanaimo Daily Free Press(1874-1928). The scope and nature of this digitization work has revealed itself to be a multi-year project for the remaining 48 reels of microfilm. The Zachor newsletter of the Vancouver Holocaust Education Centre, and the Vancouver Holocaust Education Society newsletter that came before it, publishes unique writing from Holocaust survivors, their families, Centre staff as well as community members, including BC teachers and students. The newsletter includes articles about commemorative events, collection highlights, educational programs and exhibitions developed by the VHEC. Zachor is a foundational publication about Holocaust commemoration and education in British Columbia. At present, issues from 2004 to 2018 are available on our website. The VHEC would like to digitize 60 issues published from 1990-2004, to create a complete digital record of the publication. Our new “One Earth: Spotlight on Sustainability” Collection Spotlight is up. Books featured in this display include topics such as: Sustainability, Ecology, Environmentalism, “environmental protection”, “conservation of natural resources”, “climate change” or “climate changes,” and climatology. 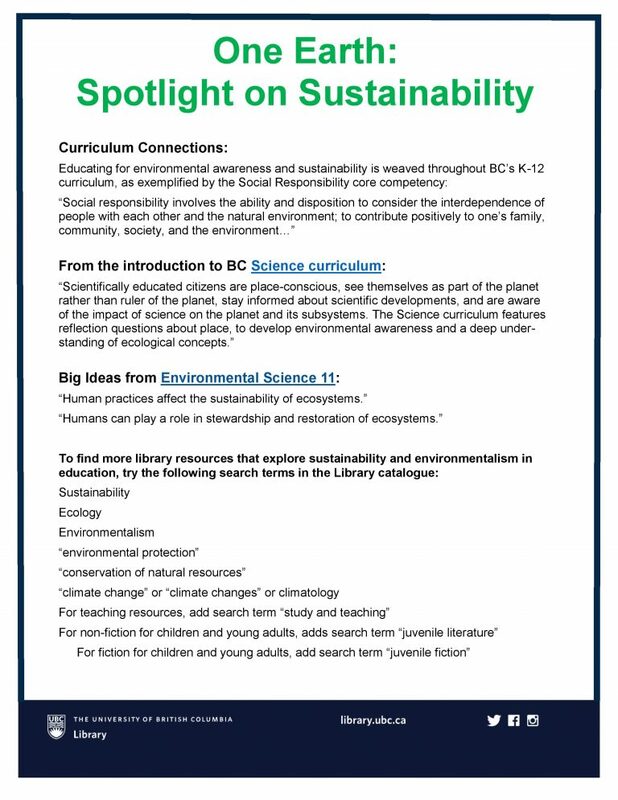 You can also find our “Curriculum Connections” handout (available below and on the display) showing the links between these books and the BC Curriculum. Starting a new business requires a lot of research from the outset. What is happening in the industry? Who will my competitors be and what are they doing? What is the demand like for my product or service? Knowing how and where to search for this information is vital to the success of a new venture. To help entrepreneurs and small business owners tackle the business research cycle, the Small Business Accelerator program created a series of five video modules which explain the process. Each tutorial contains a short video, a worksheet and a quiz and takes approximately 20 minutes to work through. 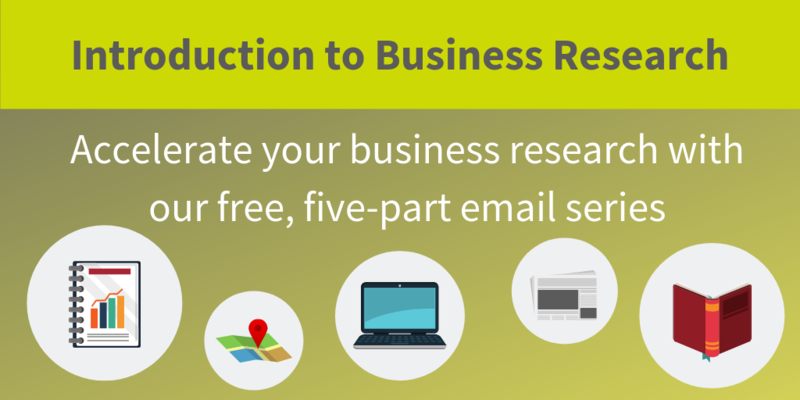 In April 2019, these videos evolved into the “Introduction to Business Research” email series, an initiative which invites entrepreneurs to receive the modules by email to complete over five days. By the end of the series, participants should be familiar with market research basics and understand how they apply them to their situation. The emails also direct to further resources and support available from the Small Business Accelerator program. Taking part in this educational series is completely free and you can sign up to get started right away. Submitting your details does not add you to any mailing lists – so no need to worry about spam. If you would prefer to browse the tutorials at your own pace, the materials are also freely available on the website. Today is World Book and Copyright Day, an international event in support of books, reading, and literacy. This year, the focus is on protecting and supporting Indigenous languages, in conjunction with the International Year of Indigenous Languages. You can read more about World Book and Copyright Day on the United Nations and UNESCO websites. In recognition of World Book and Copyright Day, we’ve gathered together items from our collections that showcase reading over the past century. We hope you can spend some time with a great book today! UBC 1.1/16567. 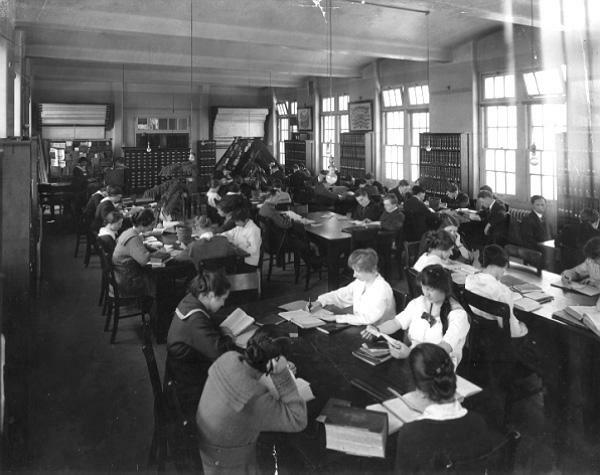 View of Library reading room at Fairview campus, 1919. 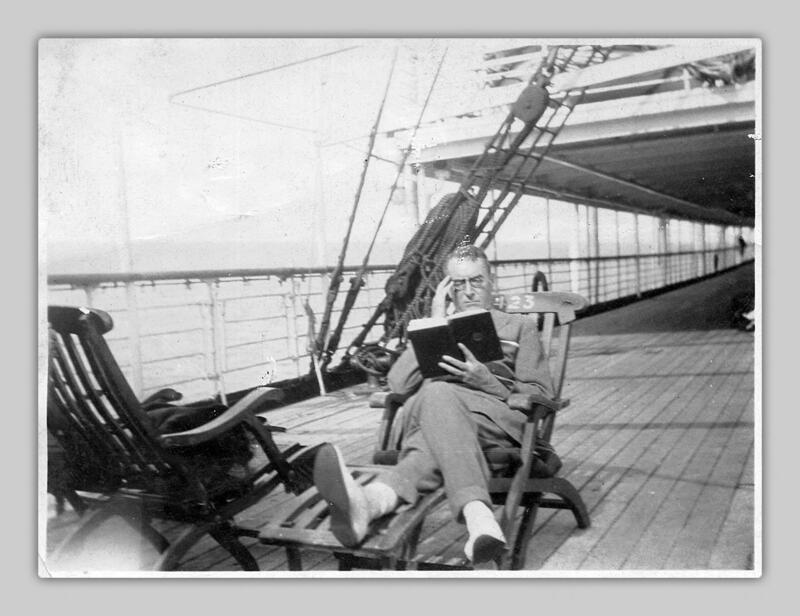 [Passenger reading on the outer deck of the first C.P. R.M.S. Empress of Scotland], [1927?]. UBC 1.1/5852-3. 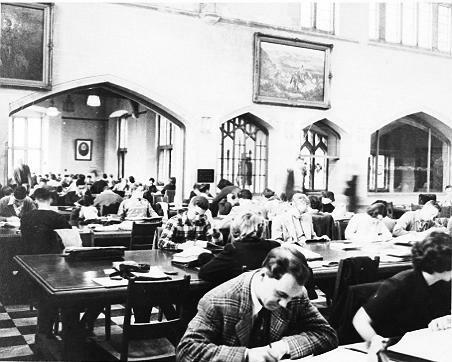 Students studying in Main Library concourse, 1949. UBC 3.1/844-2. 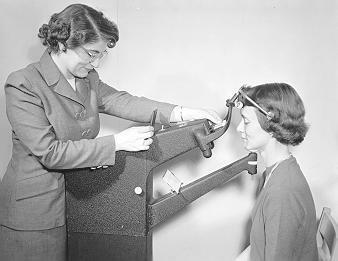 People undergoing a reading efficiency test, . 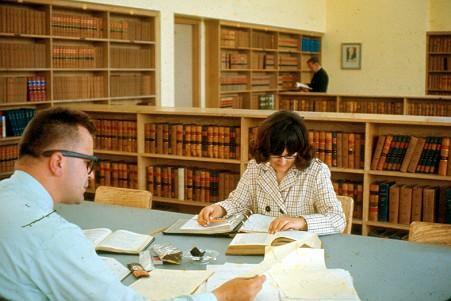 Law Library, [between 1960 and 1969]. UBC 93.1/809. 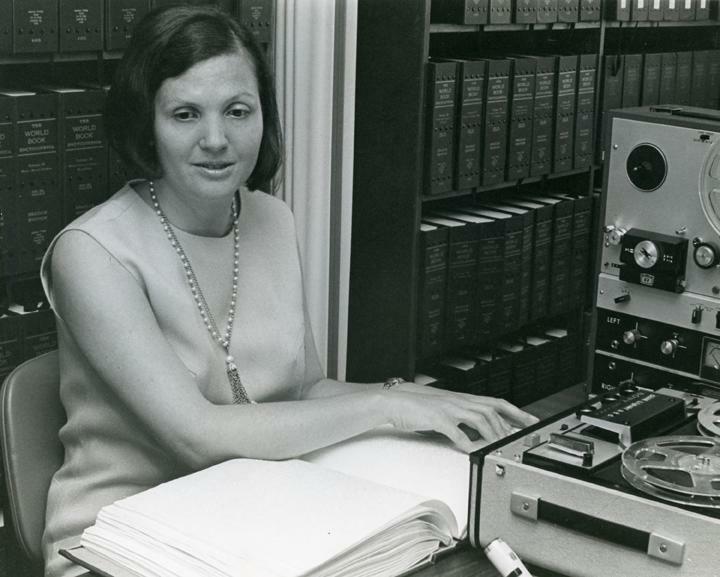 Judith C. Thiele with braille book and reading equipment in Crane Library, 1970. UBC 44.1/1231. Ker, Charles. 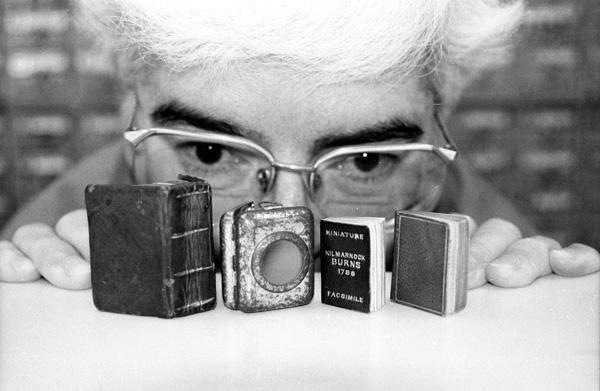 Frances Woodward, Library, peers over three miniature books from Special Collections, 1995. UBC 44.1/821. Wilson, Gavin. 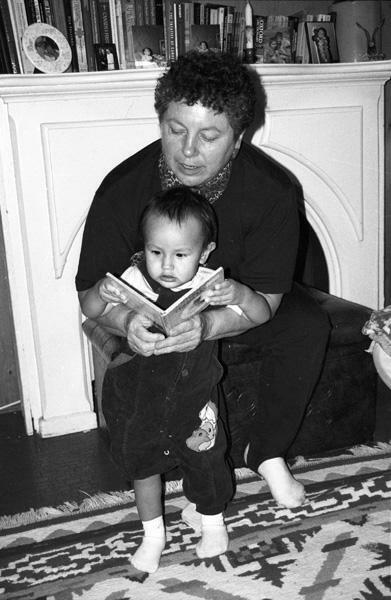 Graduate student Shirley Sterling reading to grandchild, 1997. Bryan Finlay & Nikiforos Iatrou, Witness Preparation: A Practical Guide, 4th ed. (Toronto: Thomson Reuters Canada, 2018). Geoffrey Palmer & Andrew Butler, Towards Democratic Renewal: Ideas for Constitutional Change in New Zealand (Wellington: Victoria University Press, 2018). Svein Vigeland Rottem & Ida Folkestad Soltvedt, eds., Arctic Governance, Volume 1 (London: I.B. Tauris, 2017). While relatively new to Canadian culture then—she did an internship in Toronto in 1999—she also had the unique opportunity to establish preservation-conservation processes at UBC, which, until she arrived, had not had a dedicated Conservator on staff. “National Archives has a big restoration lab with almost 20 people working there,” she recalls, who now works on a team of two with an assistant. 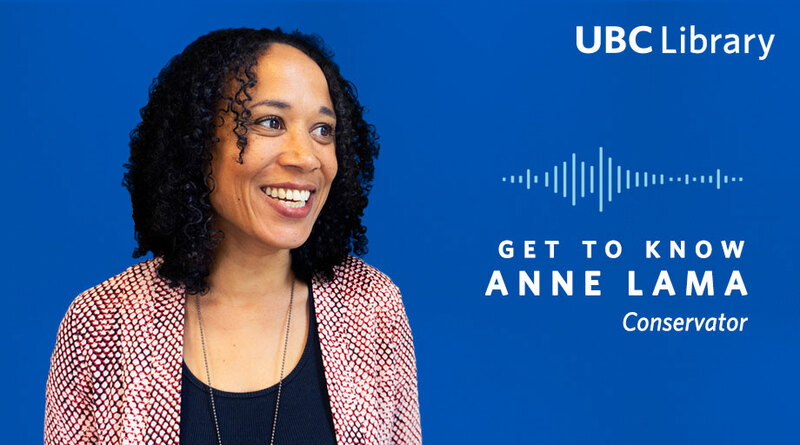 As for life in Vancouver, Anne continues to make the most of it, bicycling on weekends and visiting the pool during summer, travelling, and exploring all the art available around the city. Though she doesn’t often get the chance these days, Anne also enjoys book binding in her spare time. Anne Lama is one of UBC Library’s 2018 Employee Recognition Award winners, receiving the Employee Excellence Award for her outstanding work. Read more about the awards and this year’s recipients.